Bernie or Bust: What Happens to Sanders’ Supporters Now? After a Tuesday victory in the California primary, a Hillary Clinton nomination is considered by most to be inevitable. Bernie Sanders, though disappointed by the primary results, has vowed to continue campaigning until the Democratic Convention in Philadelphia this July. Radio Sputnik’s Loud & Clear speaks with investigative reporter Dennis Bernstein, California state secretary of the California Peace & Freedom Party, Kevin Aikan, Jane Cutter, editor of LiberationNews.org, and Gloria La Riva, who yesterday won the 2016 presidential nomination for the Peace and Freedom Party in California. The California primary was discussed, along with what lies ahead for Sanders, and whether his supporters will lend their vote to the Clinton campaign. ​Host Brian Becker mentioned that Clinton has framed her primary win as a victory for women. In her Tuesday night speech she evoked the names of Shirley Chisolm, Rosa Parks, Delores Huerta and other female progressive political figures. "Hillary Clinton is a neoliberal, war mongering war criminal and a not so crypto-racist who will throw women’s reproductive rights under the bus to get ahead." Cutter asserted. "She is not my sister and she is no kind of feminist icon in my eyes and in the eyes of countless other feminists." Becker asked Aikan if he thought independent voters in California will support Clinton out of fear of a Donald Trump presidency. "Some of them will," he replied "but voter suppression is structurally in the law. If you’re registered with no party, the election officials are supposed to hand you a nonpartisan ballot. If you want a partisan ballot, they are supposed to give it to you, whether they want to give it to you is another matter." Cutter remarked that Sanders supporters she has encountered "are sick and tired of being bullied into voting for the so-called lesser of two evils." She adding that, "…they’re coming to realize that evil is evil and they don’t want any part of it. They’re not in this to obey Bernie Sanders, they’re in this for what they call the 'political revolution.'" 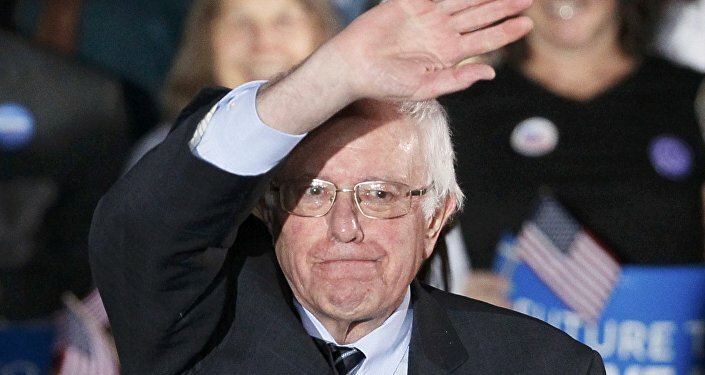 Becker noted that Sanders identifies as a democratic socialist and has called for progressive reforms including single-payer healthcare and breaking up big banks. He asked La Riva, a revolutionary socialist, the difference between her programs and Sanders’. "Making life for every human being a life of dignity is what socialists call for," she said. "We call for dismantling the Pentagon and using those hundreds of billions of dollars to create a society, from California to New York, where an income or job is guaranteed, where there can be guaranteed housing for all, regardless of ability to pay, because there are millions more housing units than there are people who are homeless or underhoused, and to make sure that healthcare is completely free.”"